Each part of a vehicle with a service product covered separately. For detailed product features and benefits, go here. SPECIAL: A FREE can of Mega Power All Purpose Penetrating Spray #120 16oz. $12.95 FREE with any or each $200 order off this page. Demo: Video: See what makes our engine transmission additives the Hi-tech protectors and nut buster, lube spray so well loved in this demo - Learn new uses for Mega Power Spray Penetrent #120. Solve, end stuck, rust frozen, wrench-breaking nut and bolt loosening trouble each day keeping #120 spray. nearby to free stuck, rusted nuts, bolts, hinges, on manifolds, locks, guns, fish reels cables, garage door wheels and its pull chain. I spray a touch of #120 on all engine fasteners making all free up and work loose easier. Avoids that occasinal stem fasterner breakage that kills hours of time fixing! Buy a case 12 pak and save $20 shipping also before 4/30/2018 for more than a intro into a handy product we sell. Order 1 to 5 cases at this special. Retail them at the cash register for: $14 to $28 each. Let customer enjoy #120 advantages. Each case of 12 shipped to you: Just $125 plus $10 tax. Example: Say you select 15 products, and they come to $200 or more, totaled. Get 15 more items for just $100 more, not $200 more, saving you $100, or whatever their 50% off price would be. No Limit. Stock up now! Save $40 on free shipping too! Order before 4/30/2018 for $140 total savings deal - where you get $400 worth of products for $300 - and free shipping. 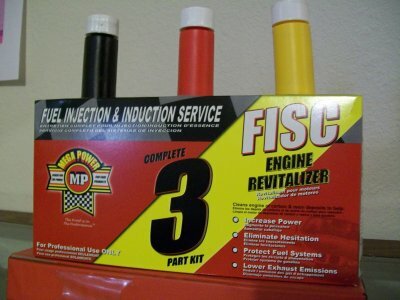 Mega Power FISC Fuel Injector, Combustion, an Emission System Cleaner with friction reducing features for race car horsepower recovery performance. 3 Item Professional Tune Up Cleaning Service Treatment. Picture above and below show kit and features. Cleans the fuel tank, filter, even removes moisture. Cleans fuel injectors quickly. Ends rough idle in minutes. For smoother idling in minutes during a tune up. Cleans sticky rings, valves, combustion area. Frees and quiets noisy valve and lifters for increased vacuum and horsepower development. Cleans reachable emission system including catalytic converter to lower emissions and for passing exhaust emission test. Results: Motors instantly idle smoother, quieter, noticeably stronger running again - guaranteed, or free. One #FISC 3 item pak. $79+$15s&h=$94 total. Plus $7 tax= $101. Order 6, 3 pak for 6 engines, 18 items, just $50 each 3 pak. Free shipping. Total $300+ $24 tax. Total $324. Save $200. Order 12, 3 pak for 12 engines, 36 items, just $35+$3 tax= $38 each 3 pak. Free shipping. Total $454 Save $600. Click to return to the Home Page... Below is the Mega Power Price list. I want to order these products, george. Take my order, please. I want to know about this.... product. We sell Mega Power. I want to place a resellers order for these products. How do I start using Mega Power in my auto repair, tune, lube, fleet care business? SPECIAL ONE: A FREE can of Mega Power All Purpose Penetrating Spray #120 16oz. $12.95 FREE. One Free with each $200 purchase. Learn new uses for Mega Power Spray Penetrent #120. Begin your day with #120 spray nearby. Save $40 shipping also before 12/30/2018 for more than a $50 in savings. Example: Say you Select 15 products and they come to $200 or more, totaled. Get 15 more for just $100 or whatever their 50% off price would be. No Limit. Stock up now! Save $40 shipping also before 12/30/2018 for $40 more in savings. Are the strongest, fastest-acting products you can use to help and protect your cars, trucks, and heavy equipment. Their success includes the ability to go where oil can't to clean, heal, reduce friction and wear, end wear and performance problems, restore like-new performance. Those for the motor, transmission, gears, and steering contain the World's Best Anti wear; Mega Power Additive MC+. Those for the fuel, radiator, and tune-up do not contain fillers - nor old formulas like most parts store additives. Mega Power additives are new, proprietary formulas that clean, smooth, heal, coat, and protect wherever fuel, air, oil, and exhaust go. These advantages restore the like new performance or keeps it, years past what any other additive can. More great driving pleasure. More great ways to keep your car care and repair expense much smaller. Super lube, and super fast nut/bolt buster. Keep a can handy. Frees anything stuck, rusted, frozen, ends squeaks. Removes moisture. Marine, shop, home use. Locks, chainsaws. A good ejector, gun barrel oil, too. One #120. $12.95.00+ $5s&h=$17.95 each. A 3 Item Professional Tune Up Internal Cleaning Service Treatment. One total service for where ever fuel, air, oil, combustion goes. Cleans the entire fuel system. Removes moisture condensation. Cleans fuel injectors. Ends dirty injector problems, rough idle in minutes. For smoother idling in minutes during a tune up. Cleans sticky rings, valves, combustion area. Frees and quiets noisy valve and lifters. One #FISC 3 item pak. $39+$15s&h=$54 total. A 6 pak, includes 18 items for 6 motors. $125+ $15s&h= $140 total. One item for the Fuel Tank side. One item for the Air intake and Combustion side feed by fuel rail or vacuum tool feeder. One item for the Oiling side below. Contains the 3 strongest made cleaners and MC+ Friction Modifiers for fast restore of loss power due to friction wear and sticky residues caused problems. Ends dirty injector problems, rough idle in minutes. Makes motors instantly idle smoother, quieter, noticeably strong running again - guaranteed, or free. Includes Fuel injector cleaner, combustion cleaner, and includes a spray to clean throttle plate and idle circuit. 1- 3 item kit $40. 6 - 3 paks, 18 items. $150+ $15 s&h= $165 total. * Tools for above two products is our Fuel Injector Cleaner-Install Tool. The "Vacuum FEED Method" to Cleans Fuel Injectors and combustion area instantly. $125+ $10s&h=$135 total. The Pressurized Fuel Rail Direct Connection Tool. Use with Kits above or any cleaner. $250+ $10s&h=$260 total. Diesel Treatment #5. Fuel conditioner. Anti-gel. Algae retarding. With pump and injector Lube Cleaner. Stops Smoke, even under load. Treats 25 gallons. Add every 3rd fill-up. [Double amount to clean dirty injectors. Cleans as you drive]. 1 - $19+ $5s&h= $24 total. 6 pak 6 items, $90+ $10s&h= $100 total. One Gallon $124+ $10s&h= $134 total. 6 pak of 6 items, $90+ $10s&h= $100 total. Keeps fuel system and injectors clean. For city-driving vehicles to keep injectors and combustion area clean. Add to fuel. A Cleaner/Fuel Conditioner. Add to fuel as needed. Conditions. Cleans. Removes water. that sit for months. Keeps fuel fresh. Easy starting. water. Keeps fuel fresh. Easy starting in hot and cold climates. spark plugs, as you drive. Add to fuel as needed. Cleans carburetor, combustion area, spark plugs, as you drive. Smooths rough idle, ends stalling, hesitation. sit for months. Keeps fuel fresh. Easy starting. Add to fuel as needed. Reduces ping. per 5 gallons fuel. Non-corrosive formula racing quality. Oil treatment #10 Add to oil, reduces oil burning. Increases compression. Frees sticky valves rings. Friction Modifies 1- $22+$5s&h=$27 total. 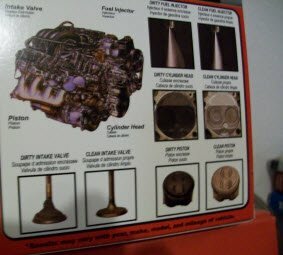 Oil Change Engine Service Cleaning Kit #ES 3 part 3 items. Radiator Flush and New Coolant Exchange Robot. Mega-Power-Additives, tools, oil filters, fast fluid exchange machines.